The Virginia Symphony’s annual series of fall outdoor concerts, Symphony under the Stars, begins August 30 in Hampton Roads with four concerts taking place over Labor Day weekend. The VSO is pleased to welcome a new corporate partner, APM Terminals, sponsor of the four Labor Day weekend concerts. Conductor, Benjamin Rous, are a prelude to the Virginia Symphony’s 2012-2013 concert season. chairs and blankets are welcome. The Virginia Symphony returns once again to William & Mary’s Lake Matoaka Amphitheatre to launch the Symphony Under the Stars series at Lake Matoaka Amphitheater at William and Mary, on Thursday, August 30, at 7:30 PM. 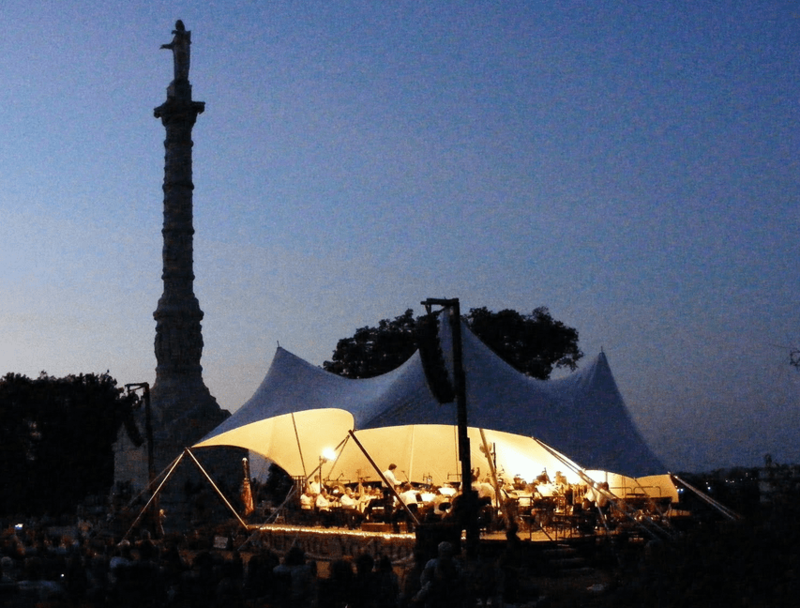 This VSO returns to the historic Yorktown Monument for its sixteenth annual concert on the banks of the picturesque York River. This concert is sponsored by the Celebrate Yorktown Committee. It is also part of the APM Terminals Labor Day weekend series. The VSO was originally slated to perform in Smithfield on July 7; however, the concert had to be cancelled due to excessive heat advisories in the region that day. The orchestra will make up for this cancelled date with a re-scheduled performance on the Windsor Castle lawn. While the orchestra is performing a symphonic concert in Smithfield, the VSO’s big band, comprised of artists from Hampton Roads, will perform at East Beach Park in Norfolk. VSO presents Jazz will transport concert goers to the height of the swing era with the best of Duke Ellington, Count Basie, Glenn Miller and more. The VSO returns to Christopher Newport University for a second annual concert on the Lawn. The Virginia Symphony caps its Symphony Under the Stars series at Neptune’s Park, 31st Street at the oceanfront with a stunning finale, including fireworks. The VSO was the four-concert centerpiece of the six-concert Symphony by the Sea series at 31Ocean. Under the leadership of GRAMMY-winning music director, JoAnn Falletta, the Virginia Symphony is Southeastern Virginia’s pre-eminent professional symphony orchestra. Founded in 1920, it is ranked in the top 10 percent of professional orchestras nationwide and serves the entire Southeastern Virginia region with performances of Classics, Pops and Family concert series in Norfolk, Virginia Beach, Newport News and Williamsburg for more than 200,000 concert-goers every year. The orchestra also offers education and community programs that reach 63,000 children, students and lifelong learners. For more information about upcoming performances, visit the VSO website.